I‘ve just come back from a wonderfully restful holiday in Southern Crete. It’s the second time we’ve been to the island and we had decided this year to stay at home for most of the summer and then take a later break for some sunshine in October. It certainly was sunny and very warm, so while we had planned to do some cycling out there, in reality the cycling was mainly rolling down the hill to the beach and jumping into the turquoise sea. All very beautiful, but I could never live there – you would struggle so much as a gardener as you’d miss the rain too much. Yes, they have plenty of sunshine most of the year but by October the ground is so dry it’s amazing that any of the plants survive – but survive they do, and after the winter rains I understand the island is covered in wild flowers. Crete is known for its wildflowers and there are around 100 species that are specific to Crete and nowhere else. We stayed in a friend’s house in southern Crete overlooking the highest mountain on the island, which is called Psiloritis and is over 8,000 feet. This range is sometimes called the White Mountains due to it being covered in snow during the winter and the limestone being so reflective during the rest of the year. The mountains have numerous gorges and during our second week, when the weather seemed ever so slightly cooler, we decided to spend some time walking these gorges. 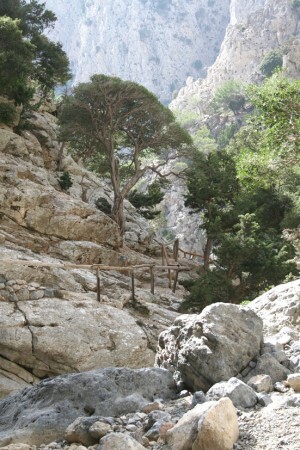 The walking guides recommended a nearby gorge called the Rouvas Gorge, which climbed three and a half thousand feet ending up in a forest of ancient oak trees. It sounded amazing so we set off. The path starts just outside the town of Zaros, a name well known on Crete as it is where their bottled spring water comes from. There is a small church at the start of the walk and the path winds up past the monastery of St Nicolas through a mixture of pine forest and holly trees. I was unable to identify the holly – guide books talk about a forest of “holly trees” but they are most likely to be referring to the oak trees higher up, as they are often referred to as “holly oaks” and I’ll explain why later. The amazing thing about the holly trees that we were walking under at the lower end of the gorge is that they were in flower and covered in bees; the whole area was alive with the sound of bees. The Cretans go in for bees in a big way and you regularly see a hillside with groups of 30 or 50 hives. As the path climbs it gets steeper, and occasionally there are handrails and even a few rickety bridges to clamber over. The views then begin to open out to the countryside beyond and it is simply breathtaking. The guidebooks also tell you this is one of the few gorges that is continuously running with water, but it wasn’t at this time of year – the area was incredibly dry and we only found one pool with water in it higher up. The path continues past several old plane trees; this is the Oriental plane (Planus orientalis) and the trees were clearly very old even though they had not gained the height usually associated with this tree. They were wonderfully twisted and covered in mosses and lichens. The actual oak forest is reached around three quarters of the way up the gorge and amazingly covers an area of 7,400 acres in total. The forest is made up of two types of oak, and this is where some of the confusion with holly trees comes in. The first type is the Kermes oak (Quercus coccifera) and the second and main type is the Holm oak or holly oak (Quercus ilex – ilex is the Latin name for a holly; holm is an old name for holly). The holm oak is a lovely tree, native to the Mediterranean; they do grow in England and tend to grow very large. In this situation in Crete, with the lack of water and the altitude, they were shorter but had grown gnarled and twisted with their wonderful dark grey rutted bark. The leaves are dark green and spiny just like a holly, and the tree is evergreen. I’d never seen them growing like this and on such a large scale. Their shade was welcome on such a hot day and the scale was stunning. Eventually the walk opens out to what must be a meadow in summer, with the holm oaks all around and over every mountain slope you could see. After a bit of lunch it was time to turn around and walk back down! November is a rainy month in Crete, although they only get an average of 65 days of rain each year. It has been particularly dry this year and they were desperate for the water, which was evident. I was pleased to get home and see that it had been raining on my garden – it makes you value the things you have.